If you are a Certified Public Accountant looking to grow your business, Solutions Office Suites can help you do that. Your clients need to feel comfortable about their CPA’s professionalism, personality, experience, and attention to detail. Solutions Office Suites office spaces are a direct representation of you and your business. Visitors to your office will see a professional running a successful business despite today’s economic climate. If you’re a CPA looking to relocate, Solutions Office Suites makes it easy to do so. Your organization can take advantage of relocating quickly and easily into the new location with ready to occupy, fully furnished office space, state of the art office equipment, administrative services, and flexible terms tailored to fit your individual requirements. Your current phone numbers can be transferred over and you won’t miss a single call. Defining budgets is something that Solutions Office Suites makes easy. Full-Time Office packaged solutions offer a single monthly bill for affordable turnkey furnished office suites that are available immediately and services that can be personalized for you. You have access to conference rooms with large plasma TV’s, perfect for private client meetings and presentations. And with a Full-Time Office, the day-to-day administrative operations and necessary professional support are already cared for, eliminating the distraction of these time-consuming tasks. This allows you to focus your energy on your clients. Virtual Office options vary. The Virtual Office can offer a physical address (not a PO Box), phone answering, conference room/day office and administrative support. Virtual Office packages can be designed based on your needs. Virtual Office provides a local telephone number and address. The package can also include access to the receptionist to answer calls, greet your clients and provide your CPA firm with the ability to achieve and maintain a professional image. As a Certified Public Accountant in Tampa, you want to show that not only are you committed to excellence, but that your clients can feel comfortable talking to you about their most personal financial matters. 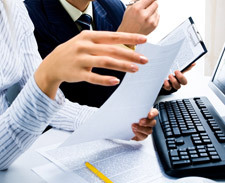 Solutions Office Suites is committed to providing office solutions to Certified Public Accountants. To learn more, give us a call at 813-229-1500 or contact us online.